Awe! That is absolutely wonderful news! 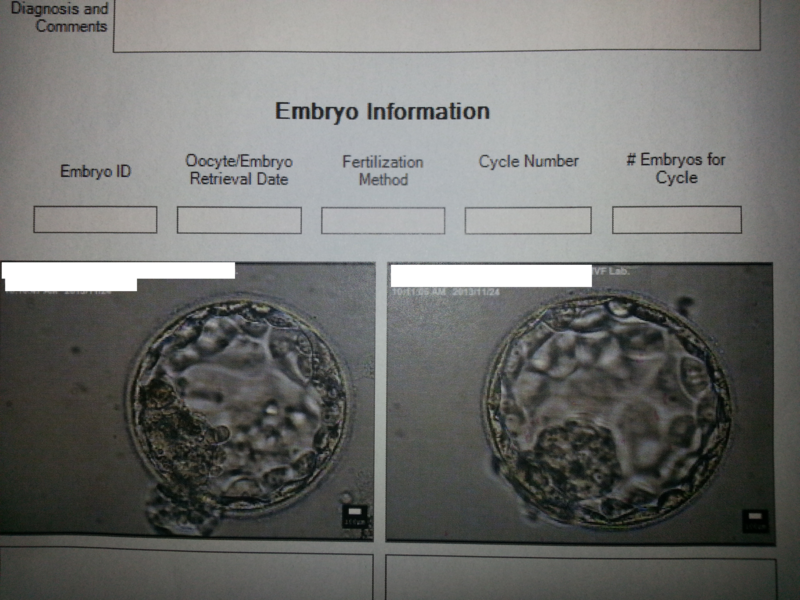 I had a very good feeling that your embryos would be awesome. So thrilled for you guys and fingers crossed that they snuggle in nicely. Also happy to hear about the stepdaughter. The sooner you can keep her away from psycho mom the better. Um WOW those are some good looking embryos! I am no embryologist, but I have seen a few in my day and those look just like they are supposed to! Congrats! 3 on ice will be awesome as well! So glad this cycle has taken such a positive turn!! I will be thinking of you!!! Yay yay yay! Such good news! Congrats on being PUPO!! Beautiful embryos! And so glad you are going for custody of your step-daughter. She is lucky to have you. This is awesome news! Now THAT’S a good donor…so many blasts! Good luck with the wait! Finally… some wonderful news for you! Great looking embies… sending you the stickiest thoughts possible so those little fellas bed in nicely and stay the distance. Best news ever!! And your embryos are beautiful 🙂 What a wonderful way to enter into Thanksgiving, you guys will have so much to be thankful for and love, love, love, that you have your Step-daughter to share the holidays with! I can’t wait to hear your POAS stories!! This is fantastic! 5 out of 6 making it to blast is crazy good. You have some beautiful embryos!! And I hope everything works out with getting custody of your step-daughter. I also like your pee stick strategy! Wishing you the best!!! BEAUTIFUL embryos! Hope they (or at least one of them) snuggle in for the long haul! Thinking positive thoughts for you. PS – I love geocaching!